I can’t explain it, but I’ve been infected with Bronze Age Marvel Madness! I’m loving old Marvel comics from the Bronze Age! This is surprising because I’m predominantly a post-Crisis DC guy (or Tween-Crisis DC guy to be exact). The Bronze Age is often defined as mainstream comics published from 1970 to 1985. Growing up I didn’t connect with most comics from the 70s. Perhaps it’s because I’m getting older, or perhaps I’m just finally appreciating these great works, but I think I finally “get” the Bronze Age stuff. Now the real question is when will I have time to read all of these?!?! I’ll probably tackle the Essential Nova next. I used to follow his exploits in the New Warriors and I’m also considering jumping into Annihilation. That Essential should be a good gateway-drug into Annihilation. I hear lots of people say they don’t enjoy reading the Essentials because they’re in black-and-white. I can understand their complaint, reading a previously-color comic in black-and-white is sort of like eating french fries without ketchup. It just comes down to what you can cope with. Once you get past the color concern, you find these comics are still really enjoyable! If you’re a fan of Bronze Age comics, you gotta visit the Comics Bronze Age site run by my buddy Andrew. He does a phenomenal job on that site! Check it out! I, for one, LOVE reading Essentials and Showcases because they are in black and white. I mean, the pencil and inks really stand out so nicely in the black and white format. Just looks beautiful to me. I too am a big fan of the Marvel Bronze Age, between Iron Man, Avengers, and Luke Cage, three of the best. Marvel Two-In-One is a classic too! You need to get the Essential Marvel Horror TPBs. Now that’s fantastic stuff! Dude, Annihilation was awesome. Actually, all of the Marvel cosmic stuff has been awesome since Annihilation. Too bad nobody has been reading it. Dude, I love the Bronze Age! Throw in some Power Man and Iron Fist Essentials and you’re all set. For non-Essentials, I’d recommend ROM: Spaceknight. Essentials Defenders is also pretty awesome. I’m up to Vol. 3 right now. Thanks for the shout out. And I’m glad to hear you’ve been bit by the Bronze bug! 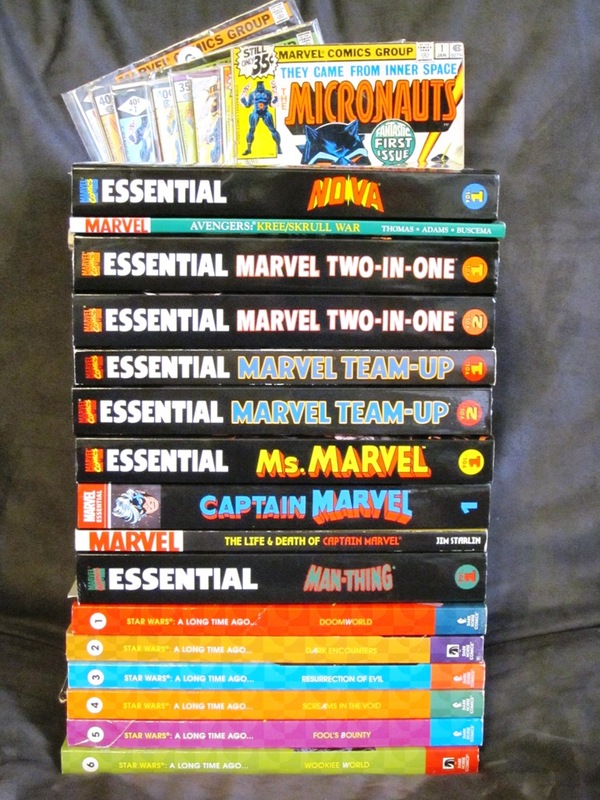 I’m a huge fan of the Essentials volumes myself, primarily for their entertainment bang for the buck. But I actually enjoy the B&W, as it offers a unvarnished look at the art. Without color, you can really appreciate the line work. The best example of this would be Essential X-Men Vol. 2 — Terry Austin’s inks over Byrne are even better than I remember (and I didn’t think that was possible!) FYI, if you haven’t read that volume, it’s the best of the Essentials, IMHO. Have fun with your reading! If we’re talking Marvel bronze age, then we’re talking Master of Kung Fu and Tomb of Dracula. Both series are well worth tracking down. You must have good taste. Don’t forget White Tiger, Black Panther, and Moon Knight!